What: Catering wedding events and offering a wide range of menu options, including brunch, hors d'oeuvres, cocktail receptions, multiple courses and dessert. Advantages: Start part-time while building business, expertise and a supply of equipment. It's a creative, fun and challenging job and can be home based. Challenges: It's imperative to be on time and well-organized, accommodating clients' needs while meeting the challenge of cooking in unfamiliar territory on an ongoing basis. It requires a high degree of culinary expertise as well as a tolerance for working long hours. Clients seek a professional caterer for any number of wedding-related events, such as bridal showers, rehearsal dinners, wedding receptions and farewell brunches. A business license and a health department-approved facility are all that's needed to get started. All equipment can be rented from party equipment rental companies. Attract business though ads in your local Yellow Pages, in the society or wedding section of your local paper and in special bridal supplements. Maintain a wedding-related or food blog and participate in popular wedding blog forums such as Wedding Bee and The Knot . Establish a relationship with local wedding-oriented vendors--florists, bridal shops, photographers, videographers, hotels and country clubs, bakeries and cake decorators, jewelers and musicians. Leave brochures with all contacts and ask for referrals. Strive for a spot on the preferred vendor list at venues. Do this by being courteous, communicative, on time and respectful of the event property. 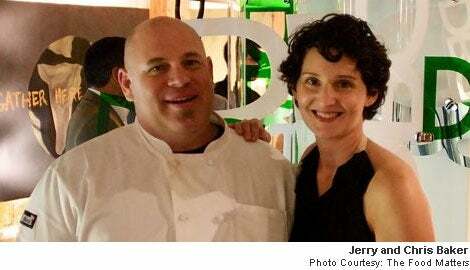 Entrepreneur.com spoke with caterer Jerry Baker of The Food Matters about how he started his successful wedding catering business with wife and business partner Chris Baker. What would you recommend people do first if they're interested in wedding catering? I think catering in general and wedding catering in particular are such stressful jobs that, besides the passion to provide great food, you have to have the passion to work long, difficult hours. First, begin at the bottom of the industry and learn what it's like to wash the dishes, load the trucks, set up scullery, scrape plates, etc.--truly invaluable time to appreciate what's involved prior to the glamour of the event night. Then begin to work on pull sheets so you understand the importance of organization and definitely think "measure twice, cut once" as your mantra. Essentially, each full-service event is setting up and breaking down a restaurant in as few as 24 hours. You learn by mistakes--one run to the store for a spatula five minutes before your bride cuts the cake is generally all it takes. There are very few businesses that have as much pressure to perform on time as a wedding caterer. You have to be very type A to succeed at a high level. Understanding the clients' needs and whims, while still ensuring that what they ask is doable and reflects well on your business, is another skill set that needs practice and attention. When you're as boutique and personal with clients as we are, it's important to have different personalities at the table with the client and be able to wade through the different personalities each client brings. Many companies hire salespeople. Finally, I would suggest that you work at least a year of events to make sure you can handle the workload and stress to be in this industry. It is a joyful, rewarding profession, but one with an amazing amount of pressure to perform beautifully and on time. Hire someone to do your billing! How did you get started? I got started by falling in love, actually. My wife has been catering for 30-plus years since she was 13 in the family business. When we met in 1986, I had a painting contracting business and was a Cap'n Crunch and SpaghettiOs kind of guy. I wanted to be with Chris, so I moonlighted as slave labor for her father and painted by day and catered by night. I found that catering and Chris were truly the loves of my life; and after doing both jobs for 10 years, I sold my painting business and committed myself to the catering business. We started in a historical museum with a lunchtime cafe and an event space. We did weddings, corporate events, birthday parties, etc. We ventured into the offsite catering business with rented vans and lots of ice to keep things cool. During the next 15 years we left the museum, built a 5,000-square-foot commissary and added a fleet of refrigerated vans, trucks, ovens, stoves, etc., to bring our kitchen anywhere. Do you think now is a good time to start a wedding catering business? I think this is the most difficult time to start a business in the expendable income arena. Caterers with many, many years of experience and clients are dropping by the wayside. Clients are going to the companies they know and trust can provide the services. Clients are looking for comfort and perceived value for all aspects of the industry. Breaking in now without a client base would be difficult at best. What services can caterers offer in this do-it-yourself world to remain cutting-edge in business? As in all business, you have those that think outside the box and those that don't. Some will remain cutting-edge throughout the entire cycle of their business, while others may never get it because they're just not cutting-edge in general. I would suggest constant travel and experimentation; I would dissuade catering conventions for those trying to be cutting-edge, as they tend to be great for people doing the norm. Look at Biz Bash [www.bizbash.com/] and look to New York City and Hollywood, fashion week and shows, designers, etc., and find what moves you. For us it's the belief that other things sometimes--but always the food--matters, and cutting-edge doesn't replace great food and presentation. What kind of person does it take to do what you do? Type A, passionate, aggressive, jovial; a leader [with] willingness to do the lowest to the highest jobs on the totem pole. Sometimes I'm the fastest prep cook we have and I'm chopping vegetables, and sometimes I'm hauling trash at 2 a.m. after 15 hours on my feet in order to help us get out. And other times I'm in an Egyptian cotton chef coat with initials and shaking hands with The Terminator, the mayor, the president, etc. So back to the beginning, you gotta be a bit of everything to do what we do. You can hire people for each segment of the business, but I feel you lose something in that translation. What kind of training and background are necessary? I think I would not have attempted this business without years of practice and learning from someone else's expertise. You get a base from the hands-on work and then can change that to your own style. Minimally, a couple years of cooking and understanding food costs, preparations, etc., and someone with the same in-front-of-the-house hospitality are needed. Luckily Chris and I do both well, and it's helped us to succeed. But we have more than 50 years of catering experience under our belts. So training and background are great but hard work, mistakes, successes, fights and make-ups are just as important . . . So in short, experience is the best background, for sure. Would you say it's common for those planning their own wedding to decide to start up a wedding-related business? Many people just going through the wedding process find it incredibly romantic and a good idea. I had a restaurant and know how difficult that is, so my romance has a buffer before I step in. (though I am going to open taquerias in the coming year--shoot me now!) I think perhaps doing an internship with your wedding coordinator, designer, florist or caterer would be the best free time you could spend to ensure you like being on the service end of a quirky bride, groom or mother or father . . . and not just being served. You can get rose-colored glasses thinking about all the good things about your wedding and what a perfect day it was. Mine was so fantastic and still the best time of my life, but I was making ravioli the night before, too, and trimming steaks--but I loved it all. That should be how you feel about the catering business: You have to love it for it to be interesting and relevant year in and year out. How much capital did it take for you to start your business? I started with a $25,000 loan and $25,000 of my own. I've invested back into the business well over a million dollars in the past few years in order to have the right equipment to do the perfect job. How did you establish your fees? I established my fees on what the market and my pocketbook could bear. As I travel to other markets, I carry the same basic pricing structure and adjust the service end of things. Certain areas demand certain services; I price my food the same and adjust the service needs accordingly. If we are traveling out-of-state for events, obviously it's more expensive, but honestly, perceived value--be it $15 a person for 1,000 guests or $400 a person for 10 guests--it's all relative to the needs and perceptions of the client. What are your closing words of advice to would-be wedding caterers? Try it; you may like it! We love what we do--we can't imagine another path to take. It is the most rewarding business when done well. The joy you bring to the client and guests gets you through the most difficult of days. Be prepared for long hours, lots of stress, and [very seldom getting a] good night's sleep. Also be prepared for an amazing list of new friends and lifelong memories that you don't get from sitting at a desk. Learn expert advice on how to give catering a go. Whether your passion is pottery, painting or playing video games, there's money to be made from your hobby. These 43 emerging and well-established businesses help couples tie the knot--and could help you turn a profit.